← Is happiness red or blue? I can’t remember precisely when I started eating cachous, but I remember this: it’s the last year of Middle School, and I’m sitting at the back of the classroom next to my friend Radu. We’re talking about all sorts of topics – chess, people, history – while sucking on cachous, regularly refilling from the little yellow box. The teacher catches us speaking, and asks: ‘Can you repeat what I just said’. I comply. The class has a passing frisson – it looks like the rebellious good student at the back of the class just go the teacher off balance. I smile, and when the teacher turns her back, I pop in another cachou, and resume my conversation with Radu. It’s a small light circular yellow metal box, about the width of a small lemon. The lid twists around the base, revealing a black rectangular hole with rounded angles on the side, about 1.5 cm long by .6 mm high. Inside the box are myriads of small black liquorice lollies, with very strong flavour. They fall off through the rounded hole. 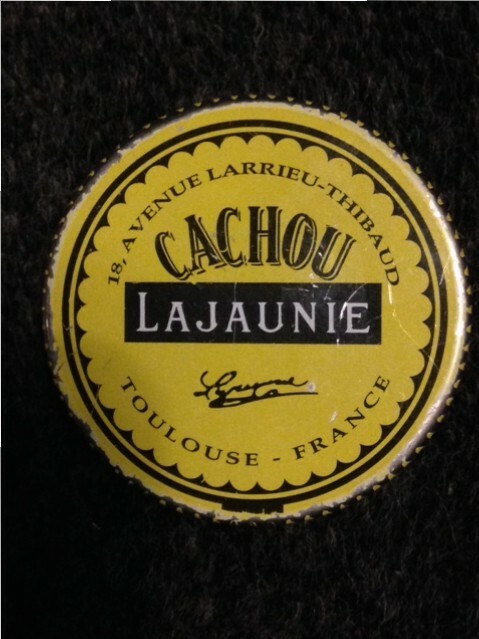 In the middle of the lid, the brand ‘Lajaunie’ appears in white font on a black rectangular band, capped by the word ‘cachou’ in fancy black shaded font, and a signature below, while on the periphery, following the curve of the box, is the location: ‘Toulouse – France’. The back bears a series of ingredients, written very small, the weight of the box (6g), a barcode, a recycling symbol of a person throwing an unidentified black object into a large woven basket, and the slogan ‘un goût inimitable, parfume l’haleine, procure une saine et agréable fraicheur’ – ‘an unimitable taste, perfumes your breath, gives a healthy and enjoyable freshness’. Cachou boxes look medicinal from up close, but like Coca Cola, marketing successfully glamourised them into pop-food. In the 80s, cachou Lajaunie had a come-back through a very popular ad campaign. The short clip showed the profile of a buxom woman in half-shadow, shaking a box of cachous in front of her while humming the tune ‘cachou cachou, Lajaunie, Lajaunie, han han’ in a breathy, sensual tone. Sales went up fast, and cachou Lajaunie moved from the top shelves of provincial pharmacies to the candy shelves in mainstream supermarkets. Cachous are one of the rare things I miss from France, and cannot find in Australia. On each of my visits to the home-country, I brought back boxes – and asked friends visiting France to bring me some. Each of these boxes contains an almost infinite number of black liquorice squares – and I often go weeks without having any – so that they accumulated over time: I now have about eight in the house, piling up inside my study drawer. Fortunately, there is no by-date on the lid or the back of the little yellow box. I assume these liquorice lollies are not perishable. At least I will treat them that way.